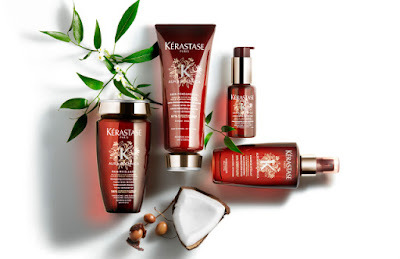 A haircare brand that has long treated hair with the same reverence as the skin, it comes as no surprise that Kérastase Paris have developed an all-natural haircare collection that is well in line with global beauty trends. For those who yearn for natural haircare with unquestionable performance and luxury, Kérastase has created what the brand believes is the “next generation of natural haircare” – Aura Botanica. Its face is natural beauty – and respected super – Toni Garrn, whose hair is pretty much what we all want, as evidenced above! But back to Aura Botanica. We have long been conditioned to think sulfates, parabens, silicones are essential if you desire great hair, but for Aura Botanica, Kérastase dedicated itself to responsibly sourcing sustainable, highly effective and concentrated actives free of all three. Crafted with pure hand pressed Samoan coconut and Moroccan argan oils, the Aura Botanica collection is 98 percent natural in origin – this is not by chance, it’s by choice. The virgin coconut oil used in the Aura Botanica collection is responsibly sourced from Samoa; it’s production help more than 200 women receive a regular income to invest in health and training programs. Kérastase’s argan oil is also responsibly sourced and organically certified. Pressed by hand to preserve maximum active nutrients, its production assists Moroccan women to harvest the oil while respecting the UNESCO forest – each woman planting 30 new trees each year. Not only does the 98 percent biodegradable formula respect the environment, the Aura Botanica packaging supports the Kérastase promise to reduce its carbon foot print. The ethical and luxurious collection also sees the introduction of the first L’Oréal shampoo to contain micellar, Aura Botanica Bain Micellaire. A fragrant, silky formula, it captures and detaches external impurities from the hair, lathering to gently cleanse in preparation for the Soin Fondamental conditioning formula that instantly melts into hair to facilitate detangling while leaving hair deeply nourished. I particularly love the Concentré Essentiel Hair Oil, a delicate formula which uses renewable avocado oil, rich in Omegas 6 and 9, and jojoba oil to add softness and shine to hair, while rosemary extract helps preserve the oils. You can use it as a pre-cleanse treatment, to boost your conditioner and even to nourish the hands, nails and cuticles – I do love a multitasker! The collection also includes the luxurious Essence D’Éclat, a moisturising bi-phase oil mist that can be spritzed on the hair at any stage of the drying process to boost softness and glow. The Aura Botanica collection is available right now, go here for more details and to find a salon near you.